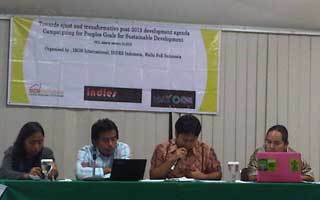 Home » Opini , Pilihan » Media Release of IPA: Junk WTO! Media Release of IPA: Junk WTO! For sovereignty and trade to serve the people! Indonesia will be at the center of world attention in 2013. The country is set to host three (3) global conferences this year that will discuss the future of world development. These include the UN High Level Panel of Eminent Persons (HLPEP) on the Post 2015 Development Agenda, the Asia Pacific Economic Cooperation (APEC) Summit, and the Ministerial Meeting of the World Trade Organization (WTO). However, a broad alliance of peasant organizations, women organizations, trade unions, migrant workers organizations, youth and student organizations, environmental organizations and other grassroots groups warned that these high-level meetings are likely to serve the global agenda of monopoly capital rather than the peoples of the world. Ahmad SH from WALHI (Indonesian Environmental Forum/Friends of The Earth Indonesia) announced to the press today the formation of the Indonesian Peoples Alliance (IPA) to spearhead and coordinate critical interventions from civil society and mass organization in Indonesia and from around the world to confront the globalization agenda of these institutions. Tony Tujan from IBON International explained that the global elites are trying to reinvigorate the trade liberalization agenda as a means to overcome the global economic crisis. For almost two decades now, the WTO has facilitated the exports and operations of multinational corporations in the third world. This has boosted their profits and wealth accumulation in the hands of elites in the US, Europe and other centers of monopoly capitalism. But it has also intensified the exploitation of working people and plunder of developing countries. Reviving the WTO’s stalled liberalization agenda in 2013 would not solve the global economic crisis but would drag developing countries and other dependent countries to an even worse situation, he concluded. Ario Adityo from the Institute for National and Democracy Studies (INDIES) explained to the press that Indonesia is a favoured target for foreign monopoly capitalists and trade liberalization because of the country’s abundant natural resources, cheap labor, big population as potential for market expansion, and no serious enforcement of human rights. He added that the Susilo Bambang Yudhoyono-Budiono administration is acting as promoter for foreign capital and local elites in Indonesia and Southeast Asia by hosting international events like the WTO Ministerial meeting. The Indonesian government even wants to take a more prominent position in the WTO by nominating Maria Elka Pangestu (Indonesia Tourism and Creative Economy Minister and former Indonesian Trade Minister) for the post of WTO Director. Ahmad SH remarked that nearly all WTO ministerial have been met with massive protests from civil society and the Bali Ministerial will face similar resistance from the Indonesian people together with civil society from around the world in December. He said that the Indonesian Peoples Alliance (IPA) will become the centre for civil society consolidation to stop ”global agenda 2013” by coordinating civil society organizations and networks which have an interest to respond critically to global processes in Indonesia such as the UN High Level Panel on post-2015, the APEC and the WTO. The IPA is calling for a stop to trade liberalization that serves capital accumulation, exploitation and inequality. It calls for an end to neocolonial relations that exist between countries today which is enforced through unequal and unjust bilateral and multilateral agreements and institutions such as APEC and the WTO. It calls on the people of Indonesia and the world to uphold their sovereignty. It calls for a new development paradigm where trade truly serves the wellbeing of the people and mother Earth.